Most homes in Rural Bangladesh are made out of tin huts that go over 45° celsius during the summer. Our employees volunteered and teamed up with Grey Dhaka to address this issue. The study, called Clean Energy Powers Local Job Growth in India, was undertaken by the Natural Resources Defence Council (NRDC) and the Council on Energy, Environment and Water (CEEW). It found that these jobs would come from project planning, construction, installation and operations required to meet the renewable energy targets and could be created in less than a decade. Government officials find the results encouraging for the renewable energy sector. A previous study estimated that the Indian solar market has already employed approximately 24,000 workers during the first phase of Solar Mission in 2011-14. According to the government estimates, the wind sector development has produced an additional figure of 45,000 FTE (Full-time equivalent) jobs so far. Consumer Education Research Society (CERS), the most active and powerful consumer body in power sector of India has demanded that all State Electricity Regulatory Commissions (SERCs) should direct State and Private Generation Companies of respective States to pay Coal India Ltd (CIL) for actual quality and quantity of coal received at their power stations. CERS requests Shri. Ashok Chawla Chairman of Competition Commission of India (CCI) and Shri Jyotiraditya Scindia Hon’ble Power Minister to take immediate action in this matter to protect electricity consumers of India from illegal practices being followed by Coal India Ltd. In present scenario the electricity companies are paying as per agreements signed with CIL for C or D grade of coal which has calorific value ranging from 4000 to 5000 kcal/ kg. In fact CIL is supplying them inferior quality of E & F grade of coal with calorific value of 3000 – 3500 Kcal / Kg. Earlier also CERS had made representation before Ministry of Power and Competition Commission of India to direct CIL to deliver quality of coal as per agreement. The Central Generation Company National Thermal Power Corporation (NTPC) recently raised this issue with CIL and signed fresh agreement where NTPC will carry out joint sampling of coal either at CIL end or NTPC end and will make payment to CIL as per actual weight and actual calorific value of coal received at its each power station. This will reduce the cost of coal atleast by 25-30% thus reducing the burden on consumers of India. CERS demands that similar agreements should be signed between State & Private generating Companies and requests all SERCs to issue such directives to sign revised agreements with Coal India Ltd. When State Companies have already signed similar agreements with Foreign Coal Suppliers then they should follow similar agreements with Coal India Ltd. It is really shocking that this burden is transferred on consumers by SERCs through Fuel Cost Adjustment (FCA) of Fuel Price & Power Purchase Adjustment (FPPPA) charges which are revised every quarter by Electricity Companies in India. These malpractice of supplying less and inferior quality of coal increases coal consumption by 25-30 %. CERS recently wrote to Gujarat Electricity Regulatory Commission (GERC) to implement similar procedure as adopted by NTPC and directed Gujarat Urja Vikas Nigam Ltd (GUVNL) and Torrent Power Ltd to sign fresh agreement in line with NTPC to reduce burden on consumers of Gujarat. The State Entity Gujarat State Electricity Corporation Ltd (GSECL) uses 0.75 to 0.8 Kg of coal for generation of one unit. In practice you need just 0.6 kg /Kwh thus increasing coal consumption. CERS has warned that if no action is initiated before 31st August 2013, then CERS will initiate legal action and file Public Interest Litigation (PIL) before Gujarat High Court to bring logical end to this matter where Monopolies are exploiting electricity consumers of India with Regulatory Commissions being silent spectators. What’s a proven way to lower your energy costs? Would you believe: learning what your neighbor pays. Alex Laskey shows how a quirk of human behavior can make us all better, wiser energy users, with lower bills to prove it. Is your state a laggard ? The Renewable Purchase Obligation (RPO) that sets these targets does not do much to enforce them. So our state governments ignore them and we suffer from power shortage. The Ministry of Power can change this obligation into a mandatory law. You should send an email to the power minister, Jyotiraditya Scindia, asking him for a strong policy that makes your state meet its renewable energy targets. The fight against power-cuts has already begun. People in Delhi are asking their Chief Minister for a renewable energy policy. Once Jyotiraditya Scindia starts getting our emails, he’ll realise that people in every State want him to make renewable energy available to them. We pay so much for electricity and yet we have to face frequent power-cuts. Last year half the country had no electricity because certain states withdrew more power than they were supposed to from power grids. You know that the coal that powers these grids destroys forests, livelihoods and wildlife. We can save ourselves from all this if our states take RE seriously. It’s not impossible. I lived in a forest for a whole month  using solar power. 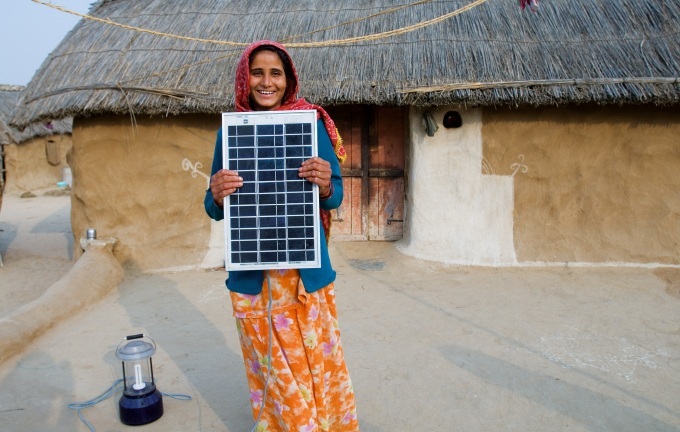 Remote villages in Bihar have electricity through renewable sources. Surely, other states can do the same. Write to the power minister now to make your state a leader in renewable energy usage. Posted on April 30, 2013 Categories Electricity & Power Supply, Greenpeace IndiaTags Renewable energyLeave a comment on Is your state a laggard ? Ahmedabad, 1st February 2013: Consumer Education Research Society (CERS) has lodged a protest before Gujarat Electricity Regulatory Commission (GERC) against power generating companies transferring the financial burden of receiving inferior quality coal on its consumers by charging them illegally. The power generating companies in Gujarat have been receiving inferior quality of coal from Coal India Ltd, which has led to an increase in the requirement of coal from 0.6 kg/kWh to 0.75 kg/kWh (increase of 25%); for which the incurred losses are being offset by charging the electricity consumers of Gujarat. Earlier these power generating companies collected a huge amount from consumers for 6-8% loss of coal in Railway transit (from Coal mines to power plants), which is now restricted to only 0.8% after the implementation of Electricity Act. CERS has requested Hon’ble Commission to direct generation companies to claim losses from Coal India Ltd and other coal suppliers, rather unjustifiably and illegally charging consumers. CERS has stated that power companies resort to this since they find it easier to burden consumers than to recover amount from the coal suppliers. Normally coal of D and E grade is required to generate electricity in power plants. It is shocking that Gujarat generation companies sign contract to purchase ‘D’ grade of coal and receive E grade coal. This increases the consumption of coal, Thereby increasing cost per unit generation and burdening consumers. The cost of coal increases by Rs. 2000-2500 per Metric Ton due to Railway freight charges, as coal is received in Gujarat from distance of more than 1000-1200 kms. In recent tariff petition filed by two generating companies of Gujarat they have claimed recovery of huge amount due to receipt of poor & inferior quality of coal which has been opposed by CERS. The state owned power generation company, Gujarat State Electricity Corporation Ltd (GSECL) has claimed recovery of Rs. 160.69 crores from consumers due to its inefficiency and receiving inferior quality of coal compared to contracted grade of coal. Similarly Torrent Power Ltd has claimed a loss of Rs. 62.0 crores from its consumers for getting inferior quality of coal. This increase in fuel cost is recovered by electricity companies through GERC approved formula under Fuel Price & Power Purchase Adjustment Charges (FPPPA). Gujarat is the first to introduce FPPPA formula other States have implemented this formula from 1st April 2012 , after directives from Appellate Tribunal for Electricity. CERS states that situation is not different in other state of India where consumers are being burdened due to receipt of short supply of coal and inferior quality of coal. The power generation companies in collaboration with Coal India Ltd exploit consumers with State Electricity Regulatory Commissions being silent spectators.